NATO Secretary-General Stoltenberg speaks during a news conference at the NATO Foreign Minister’s Meeting in Antalya, Turkey. 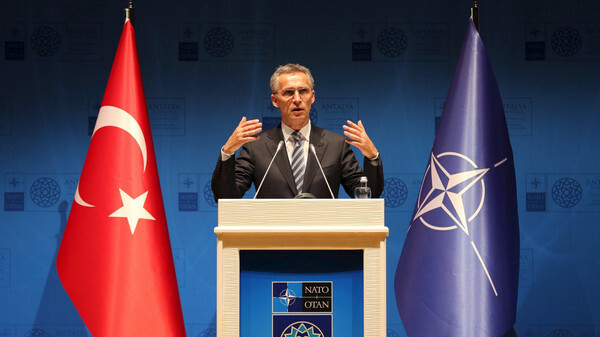 NATO will examine “all possibilities” in the fight against the Islamic State of Iraq and Syria (ISIS) group, the alliance’s Secretary-General Jens Stoltenberg said during a meeting in Turkey’s coastal province of Antalya on Wednesday. “One of the important issues at this meeting, in different formats, will be how NATO can do even more in fighting terrorism and in fighting ISIL,” Stoltenberg told reporters at the start of the meeting of the alliance’s foreign ministers, using a different acronym for the militant group. Turkey, which has long been criticized for not using its land as launch pad against ISIS, had its Prime Minister Ahmet Davutoğlu stress on the challenge of escalating violence on Turkey’s borders, the southern border of the alliance. He also urged for action against ISIS, using the Arabic term Daesh. Davutoğlu also called for a “comprehensive strategy” covering military, political, economic and humanitarian aspects, to tackle the root causes of ISIS violence. Recently, Turkey’s foreign minister said the start of a joint Turkish-U.S. program to train and arm Syrian rebels fighting ISIS group has been delayed. Mevlut Cavusoglu said in an interview on Turkish state television Monday that the program has been pushed back due to technical reasons and not because of any disagreement with the United States. He did not say when the program would start. Turkey and the U.S. reached a deal on training and arming the rebels in February after several months of negotiations. Turkish officials had previously said training would begin in March but later pushed the start date to May.